Preheat the oven to 160°C and lightly oil six 3/4 cup capacity ramekins. Line a baking dish with a tea towel folded into four, and stand the ramekins on it. Combine the sugar and water in a small saucepan, and stir over low heat without boiling until the sugar has dissolved. Increase the heat to medium and bring to the boil. Cook, without stirring, for about 8 minutes, until dark golden brown. 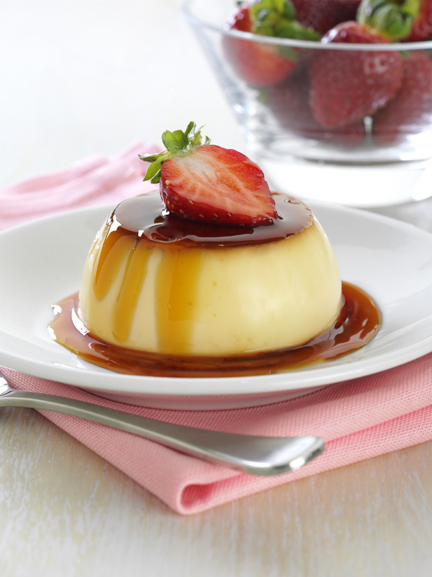 Pour into the base of each ramekin (be careful as the caramel is very hot). Leave to cool and set. Place the milk and orange rind into a saucepan, and heat until almost boiling. Whisk the eggs and extra sugar together in a bowl, and slowly add the hot milk, whisking constantly. Stand for 5 minutes, then strain into a jug. Pour into the ramekins. Place into the oven, and pour enough boiling water into the baking dish to come half way up the sides of the ramekins. Bake for 35 minutes, until set. They will still have a slight wobble. Cool, then remove the ramekins from the dish and chill for 8 hours, or overnight. To serve, run a knife around the custard, and invert onto a plate. Serve with sliced strawberries.